Not only going to Mt Fuji, have fun trying Japanese traditional costume such as Samurai, Ninja and Kimono on this tour. Hiring a minivan or bus, we will take you to one of the most popular tourist spots in Japan, Mt. Fuji. Take photos at Lake Kawaguchiko, go up to Mt. Fuji 5th or lower station, and have your own lunch at the lakeside like a picnic. When it is rainy or windy, have it at a rest house. And then, try Japanese traditional costume such as Samurai, Kimono and Ninja in Saiko Iyashi-no-sato Nemba. Wearing the costume, you can take photos with Mt. Fuji when the weather is good. We offer hotel pick up service. Using our vehicle, we will pick you up at a hotel or apartment located in Tokyo City except Adachi-ku, Arakawa-ku, Edogawa-ku, Katsushika-ku and Kita-ku at 8am to 9am. The tour is ended in Shinjuku station. On this tour, we offer hotel pick up service. Using our vehicle, we will pick you up at a hotel or apartment located in Tokyo City except Adachi-ku, Arakawa-ku, Edogawa-ku, Katsushika-ku and Kita-ku at 8am to 9am, and proceed to the tour for Mt. Fuji. From there, you will go ahead to Mt Fuji 5th station. You will arrive there at 11am and stay there for 50 minutes to look around souvenir shops and Komitake Shinto Shrine. The traffic to Mt. Fuji 5th Station is closed sometimes due to weather condition. In this case, we will try to go up to where we can go, or visit Fuji Visitor Center instead. And then, you will stop at Lake Kawaguchiko for 1 hour to take photos of Mt. Fuji, and have your own lunch at the lakeside like a picnic. When it is rainy or windy, have it at a rest house. The main attraction on this tour is the traditional Japanese costume experience in called Saiko Iyashi-no-sato Nemba. You will arrive at 2.30pm and stay there for 1 hours. 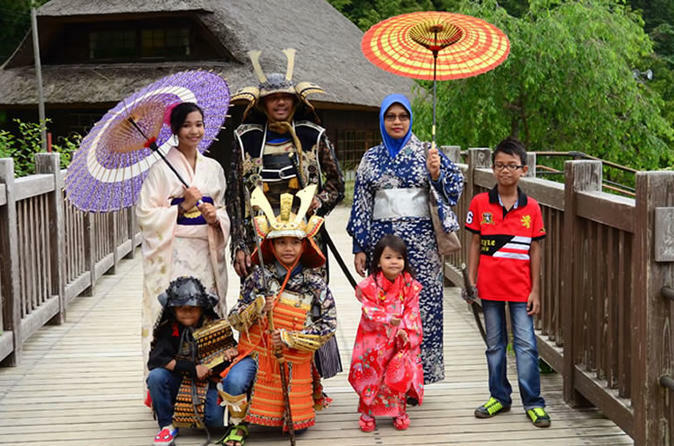 Choose a favorite costume and try to be Samurai, Ninja or Japanese Princess wearing Kimono! After that, you will be dropped off at the Shinjuku station around 6pm.